“Hello, my name is Rene and I am new” It was the first line of my first post to a forum which would turn out to change and enrich my life, and which would be the source of about half of the friendships I actually have in the real world at this very moment. I didn’t know it at that time, but I was already very aware of the pedigree and what OSS stood for in the digital motorcycle world that was forming in the (fairly) early days of the internet. I treaded lightly and took all the information that was there, to heart. Tons of people that really knew their stuff, dared to go beyond the beaten path and no-one was affraid to try something new. OSS was a place away from the internet; no distractions, no things outside of what OSS meant. It was that way from the off and everyone knew it, understood it and was very much used to it. It was “our” way, and if you didn’t understand this, you had no business on OSS. Through the years a lot has happened with all things OSS; PP took over from Mr7/11, troops were brought in from overseas to strengthen the international relationship and many hardline moderators helped to keep the ball rolling until the website was being so flooded in spam that it was not realistically possible to keep going without major work to the system. The forum was closed and not long after, the entire website was taken offline. Banoffee had already taken it upon him to start a Facebookpage, at the time meant to bridge the downtime of the forum, so that we could all stay in contact, but it swiftly surpassed the actual website in membership, and the longer it stayed offline, the more it was looking as if the FB-page was the actual base from which all was ran. This all to an outsider, off course, because those that were there for the journey, knew there was more to it. Some of the members that had been part of the former website felt out of place on Facebook and Ash was the one that opened up the Proboards-forum. A welcome addition to the FB page that was already in place and plenty members of old have found their way to Ash’s pages and a lot of info has already been posted to be used across the globe. This bring us to the Now. Firstly, I’ll have to make clear as to who has the current ownership of Oldskoolsuzuki.info ; Me. It has been signed over to me by Mr7/11, with my promise to guard and stay true to what he and PP, along with the founding members have created. I’ve surrounded myself with a few key people of the old page and the 4 of us; Banoffee, KatanaMangler, Jelly and myself, currently at the helm on FB, with Ash and Captain Chaos keeping the Pro-Boards forum running. We took it upon ourselves to revive OSS, and if you’re reading this, it’s possible that you find yourself in new but familiar surroundings. A lot of stuff has gone on behind the scenes and more then a few people have put in their time and hard earned money, just so we could get OSS back online. We’re still busy converting old articles to be available on the new home of OSS, and photo’s are being converted as we go. The old page was so full of info, that if we have chosen to add this over time, because otherwise it would’ve taken at least another year before we had anything to show for. We understand a lot of you will have questions, which we will all try to answer in future posts in the not to distant future. A forum is in place with the same guidelines as the old one was. Sadly, we could not save what was left of the old forum, to be usable and live on this page, nor is there the possibility to migrate Ash’s forum to this one, due to Pro-Board rules. This makes it a bit of a hassle and we’re sorry for that, but there’s little we can do. To be fair; some of you don’t know me and will raise an eyebrow as to “why this crazy Dutchman has taken over our page” I’ve heard this more than a few times but I can tell happily tell you; I’m not taking it over, we’re not taking it over. It has been trusted to us while originally formed between a few Dutchmen and ran by people that didn’t even live in the same country, the English language was chosen to cross borders and that is exactly what it did. In this OSS has succeeded more then anyone could ever wish for. OSS is known the world over, from the Northern most tip of Finland where they race on ice with Proboost equipped slabbies, to all the way downunder, where a fair few members race their GS’s and Katana’s and come out on top. And then there’s all of us in between; OSS is bigger then just us, and we should treat it that way. We welcome you into this new chapter in the OSS and ask you to be a part of it. It’s been a bit of a bumpy ride the last few years leading up to the point where we are now, but all is in place to give the place it’s second lease of life. Go build, race, restore and modify your bikes and make sure you keep us informed about your findings. And pictures, we like pictures. John Oliver (AKA Yoshi-Johnny, AKA YJ) is a long time OSS member and Pops Yoshimura enthusiast. John is a professional bike mechanic and many will remember his iconic take on the classic Wes Cooley GS 1000. Ten years ago, when John first rolled up at an OSS gathering on his GS, for me and many others, at the time, his bike fully embodied the true spirit of OSS. An air-cooled 8 valve GS1000 engine and classic Wes Cooley paint job but running on modern 17″ wheels, sporting a mono shock conversion and a set of gold anodised upside down GSXR forks. Evolution of the species. John’s love for Suzuki’s 8 valved air-cooled GS1000 engine has never faded. We asked John to tell us a little about his dream engine build and here is what he told us. It’s always been a dream to own a full blown Yoshimura motor but I don’t earn enough to just go out and buy one so I am gonna have to do it the only way I know how, a p.p.p.piece from here and a p.p.p.p.iece from there. So, I am in the process of getting together for the race bike I am going to prep for myself to go racing instead of others! I got hold of an old NCK drag motor a few years ago and it has a pretty good crank and gearbox in it. Crank has Katana rods and along with being welded it has straight cut primary drive gear, along with a matched one for the clutch basket. Cases have been lightened and dipped at Ribble Technologies in Preston. So the bottom end is as good as my budget will allow for the moment. I do need a new clutch before it turns a wheel in anger and this will involve having the straight cut fitted. Originally the NCK engine was a 1420 drag engine but on the road or track that sort of capacity would generate too much heat and quickly cook itself. Graeme Crosby in conversation said he preferred the power and reliability of the 998cc motor as it gave enough power and was reliable, Pops and he discovered the bigger the capacity went up, the less reliable and problematic it all became. Craig Smith, my good mate in Australia who has been on here for years is a major inspiration for the build as his black “skunk” race bike is still one of the outstanding bikes on the site. He raced it to good effect in NZ and didn’t suffer with reliability issues. He went bigger and bust his crank!His motor punted out 135 rwhp and that is my aim with this… I won’t be gutted if it doesn’t get there, but it would be nice if it’s something like. 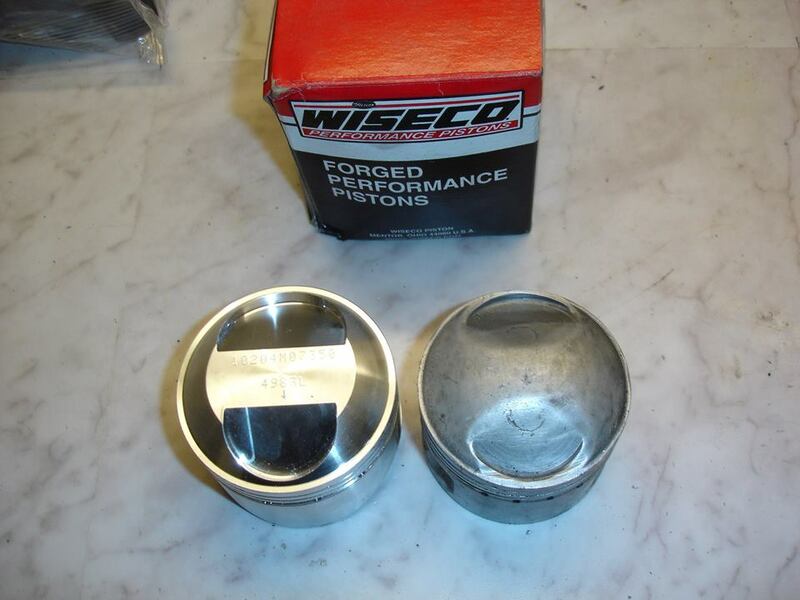 So the pistons are custom made 1100cc Wisecos and are one of only 3 sets made this particular profile I think. All the gaskets and seals will be replaced with standard (where necessary) or Cometic (where it’s ok to cheat!) and special ones (base and head). 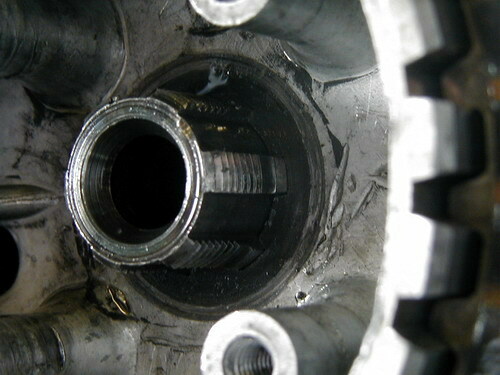 The cam chain was a weak spot on Yoshimuras race engines and the team did all sorts to try and reduce the extreme wear during races, extra jockey wheels, longer cam chain, shorter tensioner blade, POLISHED cam chain links and manual tensioner were all employed in the hunt for reliability. Most of this development actually went into the first GSXR engine. So all the above mods will be done to this engine.I have had a jockey wheel and plate made but Roger Upperton does a better version which is more like the GSXR version than the one I have. The extra jockey wheel at the back of tthe head is the reason the tensioner blade is shortened. The head has been checked over and overhauled from scratch. Bigger valves, seats cut to match and a tidy port job will make the gas go in quick and hopefully make it work right. Carbs will be Mikuni VM33s and are getting quite scarce, these are about as big as you should be going on a bored out GS1000 engine, anything bigger just makes them bog down when you crack the throttle open. Speed is all a question of money…I wanna go fast but my wallet says whoaaah. The clutch assembly fitted to all Bandit 1157 motors is, frankly, shite. Based on the same principle as the GSX-R Slingshot unit, it’s diaphragm-sprung with ten driven plates and ten drive plates of 225mm diameter (the GSX-R’s are 230mm diameter which doesn’t sound much, but offers a huge increase in surface area for friction) and has a cheap cast alloy basket with a steel reinforcement strap fitted in an effort to stop it flying apart (as opposed to the large all-steel basket used in the GSX-R). Yep, you’ll need to replace that crappy clutch basket, they are expensive new, but you could get one from a breaker, you can use one out of any Slingshot model. Beware – they look identical to the earlier Slabside one, but the 1052cc motor has different gearing on the crank. 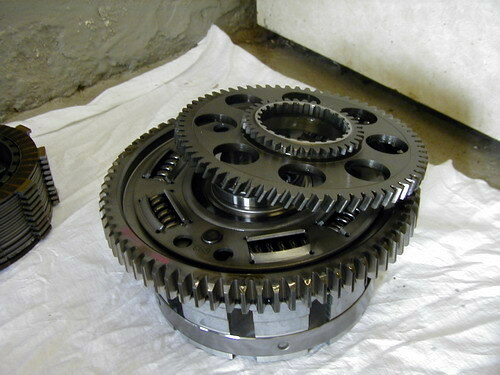 The primary driven gear at the back of the clutch basket of Slabside engine has 73 teeth. The bandit primary driven gear (being essentially a 1mm over bored 1127 motor) has 72 teeth – the same as a slingshot one. Follow the previous instructions for the GSXR’s then, once the inner hub is completely off, remove the outer basket also. 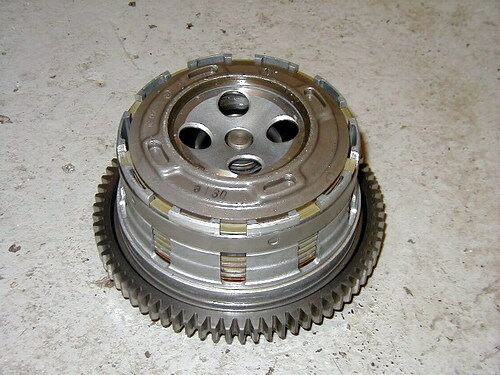 If its still stuck to your clutch basket, you will need to (carefully) remove this bandit drive gear, and fit it to the GSXR basket. They are totally different; the alternator/oil pump drive gear off a GSXR has different pitch teeth and will foul your bandit alternator driven gear and your oil pump driven gear. 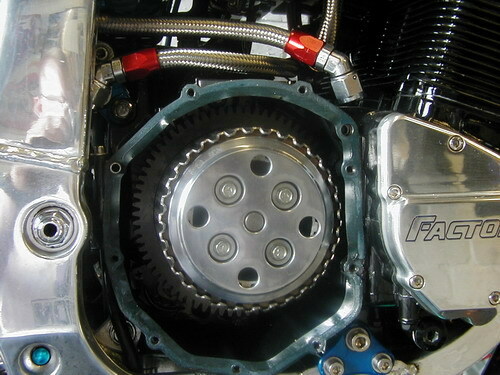 Once you’ve done this you can fit the new GSXR Basket using the original thrust washers in their original places. 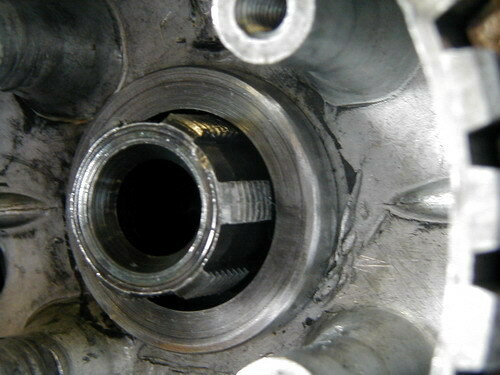 When positioning the basket on the counter shaft and sliding it ‘home’ – take extreme care to line up the alternator/oil pump drive gears with the alternator and oil pump driven gears, if they are not fully engaged, and you tighten the hub nut, it WILL snap, and they cost around £80! The counter shaft of the bandit engine is again longer than the Slabside one, but it’s different to the Slingshot counter shaft, the dimensions for the bandit spacer are 35mm O.D, 25.5mm I.D and 6mm thick. Also as the original bandit hub has a different thickness base to either of the gixxers, it still works out that you need a 10mm ball bearing to take up the slack between your original bandit pushrod, and your push piece. Again secure the hub using your original nut & washer on the new spacer fit the new GSXR clutch plates and pressure disc assy as above. And you too have a GSXR spec, coil spring clutch!, Again you can go and fit a lock up straight on if you wished!, Or leave it as it is and go and do stoopid stuff, safe in the knowledge that you’re clutch can take it! Now, extra hints and tips. Tip 1: When you do the job, put the bike on its side stand and carefully lift the front wheel and chock it on a brick – this will stop you losing any oil when you remove the clutch cover. Tip 2: When buying new clutch plates, use only genuine Suzuki parts – I know they’re more expensive, but it’s false economy to put cheapo plates in. I know, I’ve tried ALL the super-trick/heavy-duty ‘performance’ clutch plates and they just don’t compare with the genuine stuff. You have been warned! Tip 3: With this particular conversion you fine-tune the biting point by changing the ball bearing – if it drags too much (assuming you’re using the correct grade oil and the steels aren’t warped), then you need more travel so try fitting an 11.5mm one instead. If it slips (assuming the fibre plates and/or the springs aren’t worn), you need less travel so pop in a 9mm one. It really does make a difference! Also take the time to make the special tools, they’re a piece of piss to make, and really make life easier. Special tool one: You’ll need two pieces of steel bar that are 200mm long, 25mm wide and 5mm thick (ish …), drill two 6mm holes in each bar with the centres 165mm apart then, at one end of each bar, fit a M6x30 bolt and secure it tightly with a nut on the underside. At the other end, open out the 6mm hole to 8mm and join the two bars together with a M8x70 bolt and loosely secure it with a nut on the underside. To use it, the M6 bolts will neatly fit into the slots on the diaphragm pressure disc and the M8 bolt will fit straight into the swingarm spindle – once the slack is taken up, you’ve got both hands free to undo/tighten the big 50mm holder nut! Special tool two: First get one 400mm long piece of square section (20x20mm) bar and two old GSX-R clutch driven (steel) plates. Put the plates on top of one another and drill three holes equally around the diameter and secure them to the square bar using two M6x60 bolts and 20mm spacers and a couple of M6 nuts (this way, you can support the basket really well and reduce the chances off slipping, as the plates will be deep inside the unit). Finally put a small M6x10 bolt and nut through the remaining hole to secure the plates together. This is a wicked tool to have, when you’re trying to remove/secure the hub nut at 160Nm! Anyway, in preparing this article I’ve been down to my local Suzuki dealer to get the correct part numbers for you to order and latest prices (all, are + v.a.t.,and correct at August 2002), and to ensure that those of you using second hand stuff from the breakers get the right bits off the right models. I’ve already checked to see which part numbers are superseded by later ones and that the information given is correct to the best of my knowledge and experience etc– aren’t I good to you lot, eh? Before we start, I’m no journo, so you’ll have to forgive the lack of long and rambling intro and humorous asides throughout. I’m an engineer by trade and have been messing around with Suzuki’s big bore oil-cooled motors for ages and I’ve picked up a few tricks and developed a few of my own along the way. 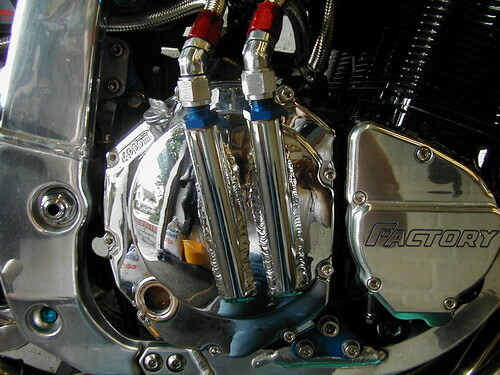 I’ve done this coil-spring clutch conversion a few times on later GSX-R’s (and Bandit Twelve’s too). It’s cheap, very effective and it’s a piece of piss, so here are the facts. There are the two types of clutch unit fitted to the GSX-R range and Suzuki’s first attempt, the coil spring type, is definitely the best. Fitted to all GSX-R Slabsides from 1986 through to 1988 (the 1052cc G/H/J models), it uses ten steel driven plates and eleven fibre drive plates and is clamped together with four coil springs acting on an alloy pressure disc. With any clutch, the limiting factors are the unit’s overall strength, the surface area available and the clamp load on the drive and driven plates. The design of the Slabside coil-spring unit excels in all three areas – this unit can easily cope with even the most ham-fisted wheelie/burnout merchant and on the road it should handle over 160bhp as stock. For the heroes or for strip use, it can be still further improved with the use of heavy-duty coil springs, and for the serious drag racers out there, there are a couple of aftermarket ‘lock-up’ type conversions, which bolt straight in and replace the existing pressure disc. The lock-up is the ultimate in super-strong non-slip clutches. Then there’s the diaphragm type. 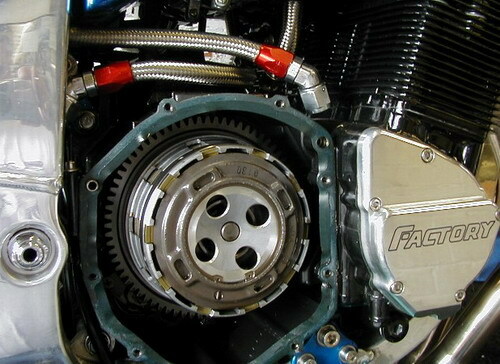 Fitted to all GSX-R Slingshots from 1989 through to 1991 (the 1127cc K/L/M/N models), it uses a similar clutch basket and the same driven and drive plates as the earlier Slabside clutch (with the exception that there are only ten drive plates in this unit), but the plates are clamped by two diaphragm springs acting on a different pressure disc design. This unit is fairly robust and is less prone to ‘judder’ than the coil-spring type, but it starts to struggle with more than 140bhp and if you like your wheelies and burnouts or if you launch it hard on the strip, it’s not long before it gives up the ghost . There is already a conversion kit on the market from APE, costing around £190, which converts a Slingshot diaphragm clutch to a coil-spring unit like that of the Slabbies and, therefore, allows the fitting of a ‘lock up ‘ kit at a latter date if necessary. But I’m going to tell you how to do it (using quality components) the cheap way. You can either get the stuff from breakers for around £30 or, using NEW genuine Suzuki parts for about £80 – about half the cost of the over-the-counter unit. And in a later article, I’m going to tell you how to fit one into your Bandit Twelve motor too, so keep any eye out for that, okay? Anyway, in preparing this article I’ve been down to my local Suzuki dealer to get the correct part numbers for you to order and latest prices (all are plus VAT and correct in August 2002). And to ensure that those of you using second-hand stuff from the breaker’s get the right bits off the right models, I’ve already checked to see which part numbers are superseded by later ones, and that the information given is correct to the best of my knowledge and experience etc. Aren’t I good to you lot, eh? The parts needed for the conversion. Then you’ll need two extra components – a 10mm steel ball bearing from your local bearing factors, and a hub nut spacer too. You’ll need to get one of these knocked up by someone with access to a lathe or any local engineering firm should make you one for around a fiver. The dimensions are 35mm OD and 25.5mm ID and it needs to be 10mm thick. Got all them? Good, so here’s how you actually do it. 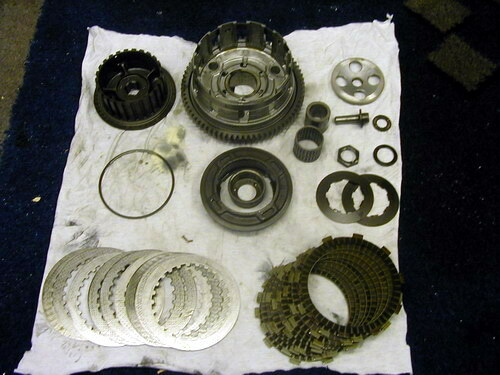 Firstly, shift the transmission into first gear and remove the nine screws from the clutch cover. Then take off the clutch cover and remove the large circlip in the centre of the hub before you take out the pressure disc lifter and the push piece and its bearings. Hold the pressure disc from moving using the special tool no.1 (see below), undo the big holder nut and remove the diaphragm springs and the spring seat and then the pressure disc. 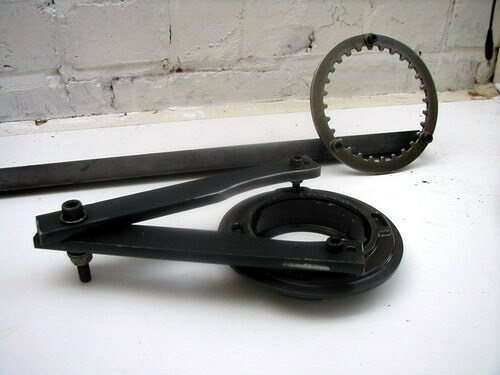 Remove the drive and driven plates, followed by the wave washer and its seat, then hold the hub with special tool no.2 (see below an’ all) and undo the hub nut and remove the nut, washer and hub assembly. Important – ensure the long (steel tipped) alloy pushrod and the thrust washer between the basket and hub is still in place or you’ll be buggered. Now fit the new hub. Problem number one – you’ll notice that the hub nut and washer will not now tighten down because there aren’t enough threads on the countershaft. This is because the Slabside hub has a thinner base and the Slabside countershaft is shorter, so this is where the spacer is needed on the driven shaft. Fit it over the shaft, then you can secure the new hub using your original nut and washer using special tool no.2 to hold the hub while you tighten the nut to the correct torque (140 to 160Nm or 102 to 115ft-lbs). Now re-fit your original clutch plates (as long as they’re not fucked, check the fibre ones for the correct thickness – 2.52 to 2.68mm / 0.100” to 0.106”) and check the steels for warpage using a feeler gauge and a piece of plate glass (max limit 0.10mm / 0.004”), starting with a fibre one, then steel and so on (you should finish with steel, if you’re not a complete wazzock). Now fit the extra fibre one you’ve just bought. Problem number two now rears its head – because of the differences in the length of the countershafts, your clutch push rod is now, effectively, too short. This is where you fit the ball bearing – it will take up the gap between the alloy pushrod and the push piece. Fit your push piece complete with its thrust bearing and washer and then fit the new pressure disc using the new spacers, springs, washers and bolts and secure the bolts in a criss-cross pattern to the correct torque setting (11 to 13Nm or 8.0 to 9.5 ft-lbs). 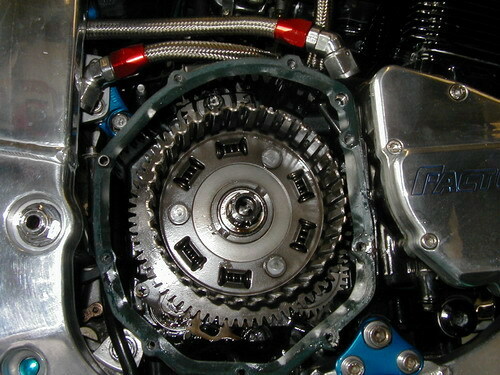 Re–fit the clutch cover, check the oil level and you’re away! 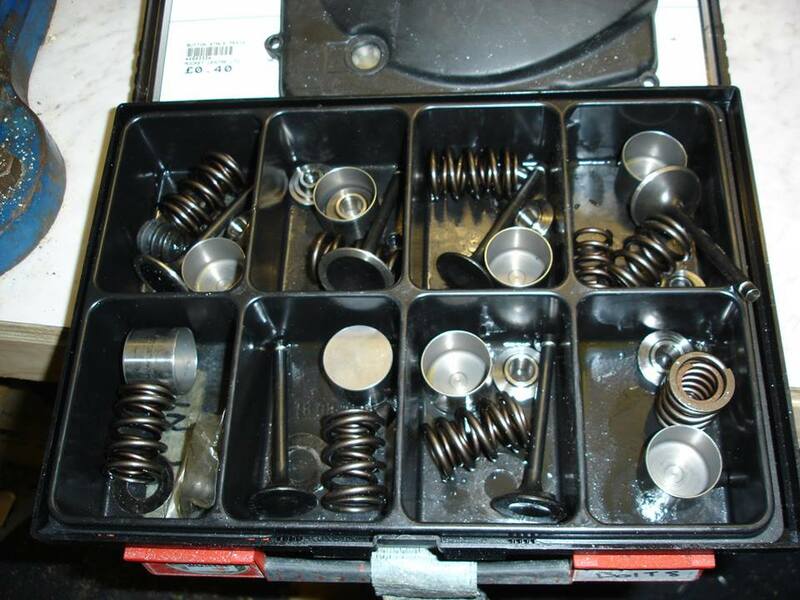 You’re now the owner of a coil-spring clutch – told you it was easy! Tip 1: When you do the job, put the bike on its sidestand and carefully lift the front wheel and chock it on a brick – this will stop you losing any oil when you remove the clutch cover. Special tool one: You’ll need two pieces of steel bar that are 200mm long, 25mm wide and 5mm thick (ish …), drill two 6mm holes in each bar with the centres 165mm apart then, at one end of each bar, fit a M6x30 bolt and secure it tightly with a nut on the underside. At the other end, open out the 6mm hole to 8mm and join the two bars together with a M8x70 bolt and loosely secure it with a nut on the underside. To use it, the M6 bolts will neatly fit into the slots on the diaphragm pressure disc and the M8 bolt will fit straight into the swingarm spindle – once the slack is taken up, you’ve got both hands free to undo/tighten the big 50mm holder nut!